By “postwar,” readers of this blog will likely realize I mean after World War II, since I model 1953. 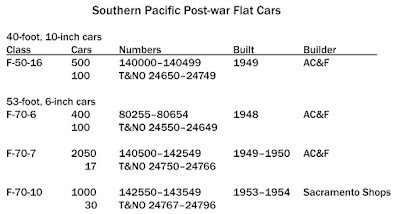 At the time of the war, Southern Pacific had a large but aging fleet of flat cars built in the 1920s, many of which were only 40 feet long. Current practice by this time had pretty much standardized on a length of 53 feet, 6 inches. Moreover, SP’s older cars were almost entirely of 50-ton capacity, while the national standard was becoming the 70-ton size. 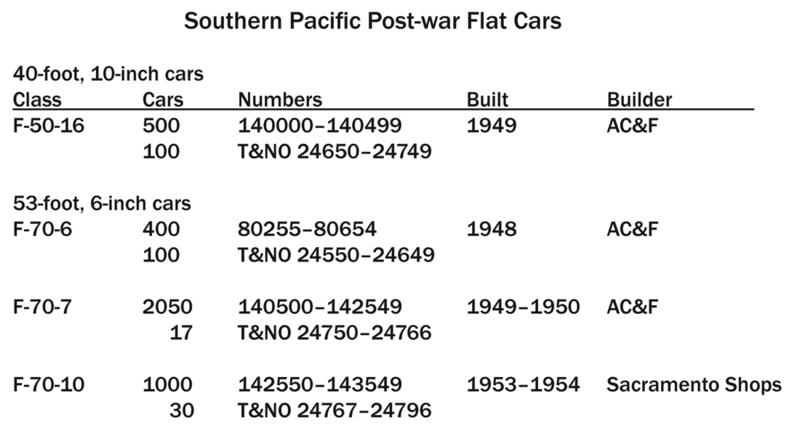 During World War II, SP built about 250 flat cars in company shops at Sacramento, and bought 300 more from Pacific Car & Foundry, spread over three car classes. All were 70-ton cars and most were 53 ft., 6 in. long (some were 60 feet long). But these new cars did not come close to meeting needs, especially for lumber shipments. Lumber traffic was booming after World War II in response to a national home-building boom, particularly in the Far West. In 1948, SP turned to American Car & Foundry for more cars, and the car design seems to have been largely by AC&F. The first 500 new cars (Class F-70-6) included 100 cars for T&NO. That class was followed by the huge Class F-70-7, 2050 cars built between October 1949 and April of 1950, all for Pacific Lines. They were largely indistinguishable from Class F-70-6, so the two classes, totaling 2550 flat cars, are essential to an SP freight car fleet. Sandwiched between those two purchases of 70-ton cars was a class of 50-ton cars, Class F-50-16, this time 600 cars with 100 of them for T&NO. Their overall appearance and design was just like the two classes of 70-ton cars, but they were only 40 feet long. And at the end of 1953, SP company shops embarked on construction of another 70-ton class, Class F-70-10, totaling 1000 cars. These were copies of the AC&F-design F-70-6 and -7, but all-welded instead of mostly riveted in construction. For modelers, it is vital to recognize that Red Caboose produced an excellent model of Class F-70-7, and sold them for some years in lettering for both pre-1956 car numbers, and post-1956 renumbering. (I reviewed this kit when it was released, in an article in Railmodel Journal, January 2005, pp. 14–17.) This kit can of course also be lettered for Class F-70-6. 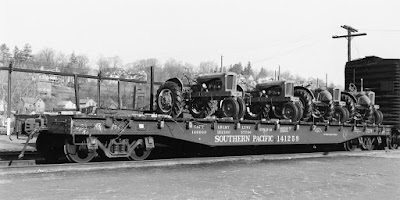 When Red Caboose went out of business, much of their line was absorbed by InterMountain, but in the case of these flat cars, the dies were purchased by the Southern Pacific Historical and Technical Society (SPH&TS). The Society has not only produced cars from time to time, but has also produced kits for the bulkheads applied to these cars in various years (see for example the prototype information and also examples of the SPH&TS bulkhead kits, in my post at: http://modelingthesp.blogspot.com/2012/07/modeling-sps-bulkhead-flat-cars.html ). A photo of one of the Class F-70-6 flat cars, with the 1949 bulkhead design on it, is below. The plasterboard load was made by Jim Elliot. The SPH&TS has offered a kit for the piggyback hardware used on these cars. The SPH&TS has also produced a kit for the F-70-10 welded cars, and currently markets a kit for that car with piggyback gear included (the announcement can be found at this link: https://sphts.myshopify.com/products/1956-f-70-10-piggyback-flat-car-kit ). If you scroll to the bottom of the page in the link just cited, you will also find kits for both 1953 and 1956 number series on the F-70-10 flat car itself, for an undecorated F-70-7 car, and for a piggyback-hardware version of the F-70-7. There also are available kits for the two later designs of flatcar bulkheads, the 1956 and 1962 versions; scroll down a ways on this page: https://sphts.myshopify.com/collections/models . Shown below is one of the kits, which happens to be a Class F-70-7 with piggyback gear. It comes with all parts, in a plastic bag as shown. Lastly, I should say a bit more about the F-50-10 class. Although, as I stated above, SP copied many features of the F-70-7 cars, they made one significant change. They lowered the sills, relative to the trucks, so that the deck could be flush with the top of the bolster. This meant that the top of the bolster and draft gear box were exposed on the deck. You can see this in the photo below (SP photo), showing car 563220, built as SP 143008. Again, you can click to enlarge. This means that the F-70-7 and F-70-10 do not only differ by the presence of rivets in the former, but also in the deck. You cannot model a -10 car simply by shaving the rivets off of a -7 model. Another point about modeling is that you can fairly easily cut down a Class F-70-7 car to make a 40-foot car of Class F-50-16, but that’s a topic for a future post. My main point in this post is that the very important postwar SP flat cars, of classes F-70-6, F-70-7 and F-70-10, can readily be modeled with the various products of the SPH&TS. This includes not only the general service flat cars, but also the bulkhead cars and the piggyback cars. This is a major part of the SP transition-era flat car fleet and, as I said, essential for SP modelers of that era.